Sir Mark Jeremy Walport FRS FRCP FRCPath FMedSci (born 25 January 1953) is a medical scientist and the Government Chief Scientific Adviser in the United Kingdom. Walport is the son of a general practitioner and was born in London. He was educated at St Paul's School, London, studied medicine at Clare College, Cambridge, and completed his clinical training at Hammersmith, Guy's and Brompton Hospitals in London. He was awarded a PhD for research into complement receptors under the supervision of Peter Lachmann in 1986 at the University of Cambridge. 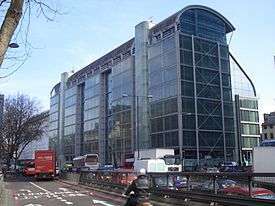 Previously Walport was Director of the Wellcome Trust from 2003 to 2013. Before this, he was Professor of Medicine (from 1991) and Head of the Division of Medicine (from 1997) at Imperial College London, where he led a research team that focused on the immunology and genetics of rheumatic diseases. Walport was appointed to be the twelfth Government Chief Scientific Adviser in 2013, succeeding Sir John Beddington. As of September 2015, in this role Walport was paid a salary of between £155,000 and £159,999, making him one of the 328 most highly paid people in the British public sector at that time. Mark Walport has an overwhelming case for election both for his earlier scientific work on the immunology of systemic LE and the role of complement and of defective apoptosis in its pathogenesis; and, as a general candidate, for his achievements as head of medicine at the Hammersmith Campus of Imperial College and since 2003 as Director of the Wellcome Trust. In the latter role he has provided national and international leadership at the highest level on biomedical research and policy issues and is widely recognised as a world leader in the promotion of biomedical science. ↑ Reed, Tanya (11 July 2003). "Wellcome to a new beginning". Reporter: The newspaper of Imperial College London (131). 1 2 Vogel, G. (2003). "United Kingdom: Mark Walport to Take Reins at Wellcome Trust". Science. 299 (5608): 803a–. doi:10.1126/science.299.5608.803a. PMID 12574591. 1 2 Callaway, E. (2012). 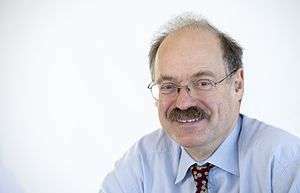 "Britain names next chief science adviser: Immunologist Mark Walport, head of one of the world's largest biomedical charities, will take on role in 2013.". Nature. 487 (7405): 20. doi:10.1038/487020a. 1 2 3 "Sir Mark Walport FRS | Royal Society". Retrieved 2012-07-05. 1 2 3 4 "Dr Sir Mark Walport". Debrett's People of Today. Retrieved 14 February 2012. ↑ Mayor, S. (2012). "Mark Walport will be next UK government chief scientific adviser, cabinet office announces". BMJ. 345: e4621. doi:10.1136/bmj.e4621. PMID 22767620. ↑ Kain, K. H. (2010). "Funding scientific discovery: An interview with Sir Mark Walport". Disease Models & Mechanisms. 3 (5–6): 265–267. doi:10.1242/dmm.005710. PMID 20427555. ↑ Anon (2012). "Good advice: The UK government's latest appointment offers hope for British science.". Nature. 487 (7405): 5–6. doi:10.1038/487005b. ↑ Gibney, Elizabeth (29 June 2012). "New chief scientific adviser announced". Times Higher Education. ↑ Boulton, G.; Rawlins, M.; Vallance, P.; Walport, M. (2011). "Science as a public enterprise: The case for open data". The Lancet. 377 (9778): 1633–1635. doi:10.1016/S0140-6736(11)60647-8. ↑ Morris, K. (2003). "Mark Walport". The Lancet. 362 (9382): 498–499. doi:10.1016/S0140-6736(03)14090-1. PMID 12927451. ↑ Walport, Mark Jeremy (1986). The biology of complement receptors (PhD thesis). University of Cambridge. ↑ "Mark Walport, Ph.D.,MB. BChir. , Member, Scientific Board". Grand Challenges in Global Health. Retrieved 14 February 2012. ↑ Walport, M.; Foulkes, I.; Weissberg, P.; Morgan, D.; Nebhrajani, S. (2012). "Medical research: No catch to UK charity funding". Nature. 482 (7385): 308. doi:10.1038/482308a. PMID 22337042. ↑ Collins, P. Y.; Patel, V.; Joestl, S. S.; March, D.; Insel, T. R.; Daar, A. S.; Scientific Advisory Board the Executive Committee of the Grand Challenges on Global Mental Health; Bordin, I. A.; Anderson, E. J.; Dhansay, M.; Phillips, C.; Shurin, R. I.; Walport, W.; Ewart, Y.; Savill, S. E.; Bordin, K.; Costello, S.; Durkin, S.; Fairburn, A.; Glass, A.; Hall, A.; Huang, M. M.; Hyman, V.; Jamison, B. J.; Kaaya, S.; Kapur, P. A.; Kleinman, D. J.; Ogunniyi, W.; Otero-Ojeda, M. A.; Poo, W.; Ravindranath, A. (2011). "Grand challenges in global mental health". Nature. 475 (7354): 27–30. doi:10.1038/475027a. PMC 3173804 . PMID 21734685. ↑ Yamada, T.; Dautry, A.; Walport, M. (2008). "Ready for avian flu?". Nature. 454 (7201): 162. doi:10.1038/454162a. PMID 18615064. ↑ Pickering, M. C.; Warren, J.; Rose, K. L.; Carlucci, F.; Wang, Y.; Walport, M. J.; Cook, H. T.; Botto, M. (2006). "Prevention of C5 activation ameliorates spontaneous and experimental glomerulonephritis in factor H-deficient mice". Proceedings of the National Academy of Sciences. 103 (25): 9649–9654. doi:10.1073/pnas.0601094103. PMC 1476693 . PMID 16769899. ↑ Brown, J. S.; Hussell, T.; Gilliland, S. M.; Holden, D. W.; Paton, J. C.; Ehrenstein, M. R.; Walport, M. J.; Botto, M. (2002). "The classical pathway is the dominant complement pathway required for innate immunity to Streptococcus pneumoniae infection in mice". Proceedings of the National Academy of Sciences. 99 (26): 16969–16974. doi:10.1073/pnas.012669199. PMC 139253 . PMID 12477926. ↑ Botto, M.; Fong, K. Y.; So, A. K.; Barlow, R.; Routier, R.; Morley, B. J.; Walport, M. J. (1992). "Homozygous hereditary C3 deficiency due to a partial gene deletion". Proceedings of the National Academy of Sciences of the United States of America. 89 (11): 4957–4961. doi:10.1073/pnas.89.11.4957. PMC 49207 . PMID 1350678. ↑ Taylor, P. R.; Carugati, A.; Fadok, V. A.; Cook, H. T.; Andrews, M.; Carroll, M. C.; Savill, J. S.; Henson, P. M.; Botto, M.; Walport, M. J. (2000). "A Hierarchical Role for Classical Pathway Complement Proteins in the Clearance of Apoptotic Cells in Vivo". Journal of Experimental Medicine. 192 (3): 359–366. doi:10.1084/jem.192.3.359. PMC 2193213 . PMID 10934224. ↑ "Senior officials 'high earners' salaries as at 30 September 2015 - GOV.UK". www.gov.uk. 2015-12-17. Retrieved 2016-02-28.